Hi Lovelies! 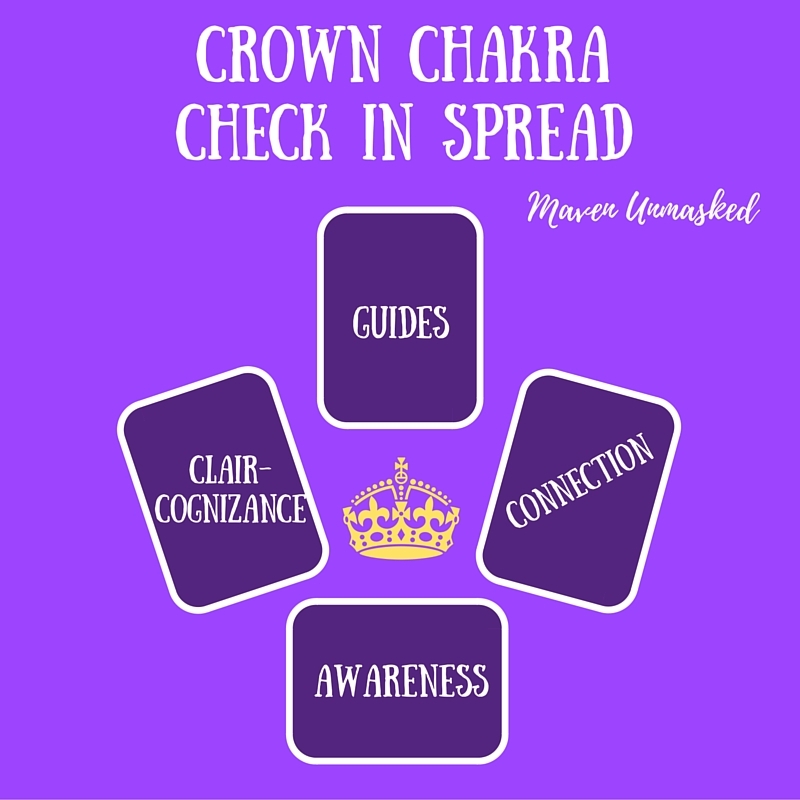 Here is a Crown Chakra tarot and/or oracle card spread that you can use whenever you feel the need to 'Check In' with your beautiful Crown Chakra. Try it out and let me know what you think in the comments below! If you'd like to know more information about this chakra of communication with Spirit, awareness, awakening, and higher knowledge, be sure to watch my Crown Chakra | Rock Your Chakras! video. Claircognizance - What do we know most clearly at this time? Connection - What can we do to help us feel more connected with others, our guides, and the world around us? Guides - What guidance do our guides, angels, and Spirit have for us at this time? We are allowing our intuition to flow more freely. We've become more forgiving of ourselves and others. We are also coming to the realization that the stress we put on ourselves is not worth the hassle. We'd rather go with the flow - to be fluid and receptive like water. It is a great state to receive new insights, impressions, and messages from spirit! We know that life has it's ups and downs, the good and the bad, the yin and the yang. We know the importance of balance in all things and that everything goes through cycles. Things change - the seasons, the weather, our lives. Everything is a cycle. We are aware that our goal is to integrate ourselves into this natural flow of the Wheel of Life. Having gratitude for our relationships, for those who support us, for all Mother Earth provides for us, and for love is a great way to help us feel more connected to the world around us. Gratitude helps keep you connected in the present moment and thankful for the blessings all around you - seen and unseen. Be grateful for life's lessons and those who bring them to you. How interesting that we received Root Chakra in our Crown Chakra spread! It is so important though. Our guides and angels are telling us that we need to make sure we have a strong foundation and are grounded - especially when working with our Crown Chakra! Spirit wants us to know that we are safe and secure. We have all we need to survive on the physical plane. When we are worried to much about the physical it can be hard for us to connect to the spiritual. Ask your guides and angels to help you feel safe, secure, and grounded in your energy. Tagged: conscious spirit oracle, crown chakra, crown chakra check in, crown chakra tarot spread, Rock Your Chakras!, Tarot, Tarot Spreads!